Rob Reich has turned Circus Bella into a forum for self-discovery. Rob Reich is a serious guy, a soft-spoken conservatory-trained composer who's an essential member of several singular Bay Area ensembles. So what's he doing hanging out with all these clowns? Having the time of his life, it turns out. As the leader of the Circus Bella All-Star Band, the Oakland accordion ace has created a vast and vivid book of tunes to accompany the acrobatic hijinks of San Francisco's Circus Bella, a one-ring spectacle that features slack wire, extreme balancing, trapeze, juggling, unicycle, and contortionist acts. For Reich, collaborating with Circus Bella doesn't so much fulfill a childhood dream as offer an ideal forum for his love of broad musical humor and stylistically polyglot forms. "I don't think the circus itself was a longstanding goal," said Reich, 33. "For me it was more a compositional dream come true. I've always been interested in different styles and humor in music, either outlandish guffaw humor or more musical kind of humor." He could easily cite an example: "When I was studying composition in high school I wrote a paper looking at humor in cartoon themes and Frank Zappa." When trapeze artist, aerialist, and choreographer Abigail Munn and slack rope specialist David Hunt launched Circus Bella in 2008, they knew they wanted to perform with live music. Munn had worked with Reich in several different burlesque shows (she co-directs the influential nouveau-vaudeville troupe Kitty Kitty Bang Bang), and immediately recruited him to assemble a band. Usually performing with five-pieces, Reich's Circus Bella All-Star combo became an essential part of the show, providing a tailor-made interactive soundtrack for each character and act. "I try to put in a few hooks that performers can grab on to," Reich said. "We bring in a piece, they listen and perform along and line up their act with the music." That's not as easy as it sounds, he assured. "A lot of time it's the drummer's responsibility to add an accent or bring up the energy. Most of the music is based on core groove or vamp with a soloist playing on top who can respond to the action on stage. Every show we get closer to the unity. But it changes every time." Over the past year, the band has taken on a life of its own, and Reich celebrates the group's eponymous debut album on San Francisco's Porto Franco Records at Freight & Salvage Sunday with an expanded eleven-piece ensemble including violinist Dina Maccabee, trumpeters Henry Hung and Ian Carey, and reed players Sylvain Carton, Tom Griesser, and the dependably brilliant Ralph Carney (a classic case of name-shaped destiny, who long before joining Circus Bella brought antic carnavalesque humor and extended techniques to recordings by Tom Waits, Oranj Symphonette, Tin Huey, and The B-52's). Circus Bella usually performs outdoors, but for the Freight show the troupe is venturing inside to give a taste of the action that inspired Reich's music. The band and circus are in the midst of their fourth season, staging free shows around the region, and will be heading to the Freight directly from a noon performance at Oakland's Dimond Park. In an era when even Broadway shows often rely on canned music, Circus Bella's commitment to the band is more than admirable. As Munn testifies, performing with improvisers who have a well-honed high-wire sensibility turns every act into an adventure. "It's so much more alive, there's so much more charge in the moment, so many more variables, in a good way," Munn said. "The core group is so committed and sounds so tight." She added that the benefits of being live and in-the-moment more than compensate for the extra work of rehearsing a band, and the risk of using humans, rather than pre-edited material. "Sure ... everyone has a Mac now, and can edit music to have whatever they want. But when David and I decided to start Circus Bella in our first conversation we have to have a live band. More people means more logistics and we're always trying to convince people you really want the band." Reich may not have dreamed of running away to join the circus as a tot, but he had plenty of relevant musical experience before joining the Circus Bella cast. The Long Island native studied composition at Oberlin, and headed straight to the Bay Area after graduating in 2000. 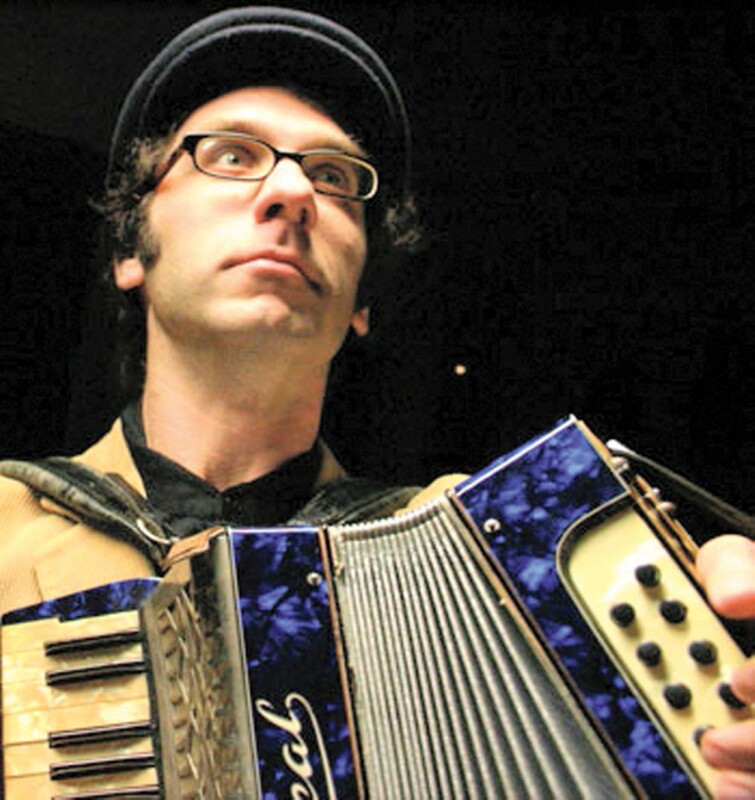 He initially supported himself teaching piano, but he had grown up with a beautiful, antique, fully functional toy accordion that he lugged out west, even though he had never played it seriously. He started playing improvised duo sessions on it with pianist Gus Burns, which inspired him to buy a concert accordion. After delving into klezmer and various folk styles, Reich found enough work that he quit teaching and started playing and composing full time, founding the klezmer combo Kugelplex (which is still on the scene, though he's no longer a member). 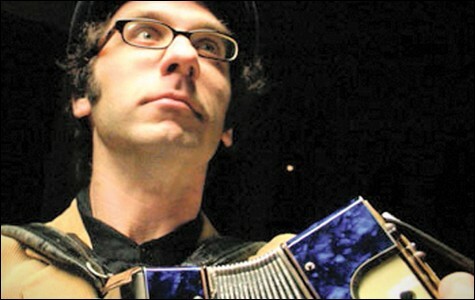 Over the past five years he's become an essential element of several celebrated bands, including guitarist Dave Ricketts' Gypsy jazz-inspired Gaucho, which released a stellar Porto Franco album last, and the trumpeter Darren Johnston's Nice Guy Trio, an all-embracing ensemble that combines folk influences with jazz's improvisational imperative. Most recently, he joined Tin Hat, the long-running avant-chamber ensemble featuring Berkeley clarinetist Ben Goldberg, guitarist Mark Orton, and violinist/vocalist Carla Kihlstedt (who presents her Jorge Luis Borges-inspired extravaganza "Necessary Monsters" at Yerba Buena Center for the Arts on July 29-30, an elaborate production featuring Reich and Circus Bella All-Star Dina Maccabee). Whatever context he's in, Reich transforms it into a creative hothouse where thousands of musical flowers bloom. Goldberg can attest to that. "I'm so impressed with him," the clarinetist said, adoringly. "He's so accomplished, and he'll always surprise you, always try something or hear something new. It's a combination of amazing technical command of the instrument and his mysterious resources and depths. He's got a wonderful sense of humor that shines right through. His arrival has definitely reinvigorated the Tin Hat, no question." Circus Bella seems like an ideal situation for Reich, with the constantly shifting musical demands required by the action on stage. Rather than subverting circus music conventions, he unleashes the incandescent personalities in the band, crafting pieces to showcase their individual voices. He can indulge his love of John Philip Sousa marches, and draw on his expansive stylistic palette, referencing Balkan brass bands, Delta blues, shtetl weddings, New Orleans funerals, and Looney Toons shorts. While some people join the circus to reinvent themselves, Reich has turned Circus Bella into a forum for self-discovery, a journey that evolves with each new act. But he describes it in plainer terms. "Everyone in the circus has a trick," Reich said. We can be chameleons. Showcasing all the different styles you can play, that's our trick." Nels Cline’s new band debuts at Freight & Salvage on Feb. 17 in what could be a rare appearance.